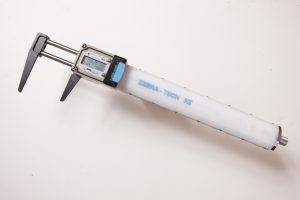 With the Zebra-Tech Dive Caliper you can record measurements at the press of a button and eliminate transcription errors while at the same time speeding up your work. With an operating depth rating of 40 metres, the Dive Caliper is used by scientific divers, fishing divers and engineers during benthic surveys, maintenance programs, oil and gas engineering measurements. When ordering two Dive Calipers for his post-graduate students, a university professor who has been studying coral reefs for 30 years stated that he wished the Dive Caliper had been available when he was studying for his PhD. At the end of diving, simply connect the Dive Caliper to a PC and download the CSV file into a spreadsheet.